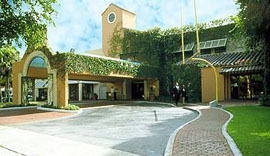 ABOVE: A video montage of Don Shula's Hotel. Watch more hotel videos. This page allows you to find directions, post a comment, read reviews, and check rates at the Don Shula's Hotel. Rates: Low season from $125. High season from $185. Don Shula's is located on quiet, hometown Main Street. It is in the center of upscale shops, restaurants, and a multiplex theater. The hotel boasts a 4,400 sq. ft. Athletic Club and is minutes from Don Shula's Championship Golf Course. Don Shula's is an oasis away from the stresses of the city. This hotel is perfect for a restful vacation, corporate meetings, and social functions. High Speed Internet access is available in all guestrooms. Click HERE for Don's Shula's Lodging Information. • Leaving the Airport, follow signs to 836 West. • Exit at NW 154 Street and continue East. • Continue East on 5th Street 7 blocks to Main Street. • Turn Left at the second intersection. • Turn Right on Main Street. • The Don's Shula's is on the Left side of the street. Miami Lakes, FL 33014. Use our Miami hotel map to find the exact location. Shula's Hotel in Miami was the worst hotel stay my wife and I had in years. The online reservation process requires you to pre-pay for your room. That wasn't a problem, however on arrival we were told (in a very rude and argumentive manner) that our stay was for a day less than what we had paid for and it didn't matter what our "voucher" said. The beds are horribly soft, the carpets were stained and dirty, with garbage left under the furniture. The roaches come as a standard feature, no extra charge. Maid service? Had to request that the room be made up and fresh towels at 3:30 in the afternoon. On the last day, door key did not function and had to get that fixed also (1st clerk wanted us OUT a day early). In summation....Days Inn, Salvation Army, anything would be better than Shula's.